When Metha Masumoto got sick, she knew she'd need to leave her home in the Marshall Islands. There is no cancer doctor in the small nation of about 75,000, which spans 70 square miles of Pacific atolls and islands halfway between Hawaii and Japan. And she doesn't have insurance. The 49-year-old points at her side, then her stomach, as she describes near constant pain and occasional numbness, and says she's been told multiple times that she needs surgery. After being denied treatment in Hawaii, she moved to Washington this spring in hopes things might be different. So far, they haven't been. "She's tried to go to Deaconess three times already and they won't be able to perform any surgery without insurance," says Rose Kabua, translating as Masumoto speaks in Marshallese with the Inlander after a community health forum Saturday afternoon. "She can't work, she's too sick." Her story is all too familiar to friends and relatives who are among the more than 1,000 Marshallese community members living in and around Spokane, and the thousands more who live around the United States. Between 1946 and 1958, the U.S. government contaminated the Marshall Islands with massive amounts of radiation when it tested 67 nuclear explosions there, blasting craters out of the sea, rendering whole islands uninhabitable, and then researching the effects of radiation on human beings. For decades, the Marshallese have been allowed to live and work in the U.S. legally as part of the Compact of Free Association (COFA), an international agreement that spells out the relationship between the U.S., Marshall Islands, and other Pacific island countries. But despite paying taxes while living here, they and other COFA migrants are not eligible for Medicaid or other federal programs, which has left many who would otherwise qualify without a way to pay for basic health care. Members of the Marshallese community in Spokane and their allies around the state are pushing to change that as they support proposed Washington state legislation that could pay for insurance for those most in need. "Our goal is to achieve health equity, and mainly to improve our health," Kabua says. "I think we need to tell our Senate, everyone, that you know, we're hurting. We need help. If you need help, you ask." 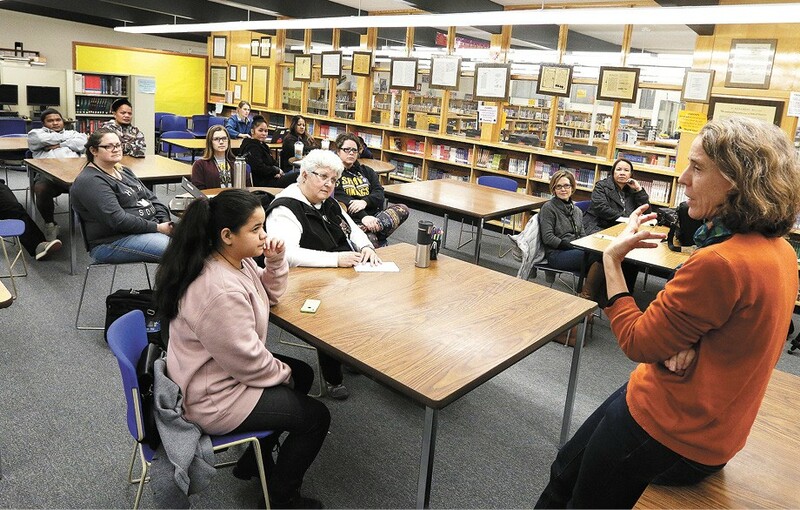 As most Shaw Middle Schoolers ran out into the first winter snow at the end of school Friday afternoon, immediately packing the powder into snowballs and squealing about the cold, a few of their classmates stayed behind, making their way to the library for a special presentation. Among them was 14-year-old Milden Bejang, an eighth grader and student body president. He moved to the U.S. from the Marshall Islands when he was 3 and has been in Spokane for about 3 years now. "I'm interested to learn more about my culture," Bejang says. "I've been here most of my life." For two hours Bejang and a handful of Marshallese students, their parents and teachers from the school listen as University of Washington Professor Holly Barker talks about the history of U.S. nuclear testing in the islands and the lasting health impacts. Barker first went to the islands as a Peace Corps volunteer, and later worked for the Marshall Islands embassy in Washington, D.C., for about 15 years. She helped the Marshall Islands government study and interview people who were impacted by the testing, and sorted through differences in what her team found versus what the U.S. had told them. After World War II, she explains, the U.S. had only just discovered a weapon of mass destruction in the nuclear bomb, but knew very little about the human impacts. After gaining control of the northern Pacific, the U.S. chose the Marshall Islands as a testing ground. Dozens of bombs were detonated, but the most significant was Castle Bravo, which on March 1, 1954, exploded with almost three times the force scientists had expected, 1,000 times stronger than either of the bombs dropped on Hiroshima and Nagasaki. Though the U.S. had removed people from Bikini Atoll, promising they could come back after, the people on Rongelap and Utrik atolls hadn't been moved, Barker says, and when the force was more than expected, they were blanketed with fallout from the blast. "They talked about it snowing, since the blast pulled in coral and sand so there was white ash," Barker says. "I interviewed people who tasted it, didn't know what it was. Some picked it up and put it in their pocket. People were so sick, they got very ill."
The U.S. set up a study of those who had been exposed, called Project 4.1, and had doctors from defense labs study the impacts through the '90s, Barker says. "They became human guinea pigs — they used that phrase, which is interesting because that animal doesn't live there," Barker says. "Some had burns down to their bones, their hair was falling out." They ate food contaminated with radiation. The U.S. doctors not only studied the impacts from the blasts, but also injected "control" subjects with radiation in their blood, pulled healthy teeth to study the impacts, took painful bone marrow samples over years, all without proper translation or consent of the people they were studying, Barker says. Women started having deformed babies, calling them things like "jellyfish babies" for those born without bones and translucent skin, or "apple babies" for those who were born with large and misshapen heads, Barker says. Cancer, diabetes, thyroid and kidney problems are all very common among the Marshallese. "This is the history of this barbaric ... I've never found the right words for it, for what this is," Barker says. "There are these instances of exploitation and cruelty and experimentation we hear about throughout U.S. history, but this is one that has remained silent for all these years." We don't learn about this piece of history in school, Barker says, but she hopes the teachers who watch her presentation can find a way to teach it to their classes. One way to approach the subject that Barker suggests? Spongebob Squarepants. Know where Spongebob lives? Bikini Bottom, as in underneath Bikini Atoll. The creatures in the show are mutated, and live-action sequences feature atomic blasts. And because of Hanford, Washington has a particularly close tie to this story, Barker says. "When the Marshallese come into Washington state with health care issues connected to the nuclear weapons testing, they're carrying the plutonium that originated in Washington state," she says. "So for our health care facilities to deny coverage to the communities that are carrying the plutonium that we produced in Washington state, it takes that assault and injury even further." She asks the students and families present if they've got stories of health issues in their families. One man says his sister-in-law has kidneys that aren't normal, has cancer and needs to be on dialysis. Others nod, and when Barker asks if anyone can think of a Marshallese family without a single person with cancer, no one can. Afterward, Jimmy Jacob, who watched the presentation with his two sons, says his grandparents helped clean up contamination on the islands, and they later got sick. Now, he tries to help others in his community here, volunteering to get them to appointments and translating things with their insurance when needed. "And many more people, they don't have insurance," he says. There are many Marshallese who would qualify for Medicaid, if not for welfare reform changes Congress passed in the '90s, which made COFA migrants ineligible for the program. Kabua, who is president of a Marshallese Community Advisory Board started last January, says it's not uncommon for people in the Marshallese community not to have a primary care provider or get regular check ups of any kind. Many wind up going to the ER for things they should be able to have checked at a clinic. For many, the only way they can get insurance is by applying through the exchange for a plan they would have to pay for, Kabua says, but many can't afford it after taking into account co-pays, premiums and deductibles. "If you don't have any means of income, how are you going to pay for any of these out of pocket expenses?" Kabua says. "If you have a $5,000 deductible, how are you going to pay that if you only make minimum wage and you have four or five kids?" To help, they're calling on the Washington State Legislature to pass a bill that would provide health insurance to eligible COFA state residents. Last session, Rep. Sharon Tomiko Santos, D-Seattle, introduced HB 1291, along with Spokane Democratic Reps. Timm Ormsby and Marcus Riccelli. The bill would provide premium assistance, paying for insurance coverage and out-of-pocket expenses for COFA individuals making up to 133 percent of the federal poverty level. It passed through the House, but didn't get a vote in the Senate. "Pushback I heard from some of my Republican colleagues was that it was really the federal government's responsibility, and they should pick up the tab," Riccelli says. "Which I agree with, I just think if they're not, we need to step up." The legislators intend to bring the plan forward again this session, and just last week Gov. Jay Inslee included $2.6 million to pay for the fund in his proposed 2018 supplemental budget. In gearing up for the session, Riccelli and other guests listened to Marshallese community members' health concerns and questions Saturday, as Barker again spoke about the history of the Marshall Islands testing before a larger gathering at Spokane First Church on West Indiana. Some spoke of billing issues, others wondered how their children might be impacted as many of them aren't U.S. citizens either — the COFA allows Marshallese people to live and work here, and serve in the military, but does not afford them citizenship. Not all their concerns will be addressed by the legislation. On hearing about Masumoto's struggles to get surgery, Riccelli, who works for CHAS Health, told her there are organizations that can help find funding for surgeries, and he passed on his contact information saying he would help her get in touch with them. Masumoto said she was very hopeful about finding some solution after hearing that. Two of her sisters, who also grew up in the Marshall Islands, have already died from cancer, one was in her teens, the other was in her mid-50s. Though the bill isn't a perfect solution, it's a first step, Riccelli told those gathered at the church. The original print version of this article was headlined "Forgotten Fallout"